Like many other countries in the world, USA (United States of America) also got it independence from others. USA got its independence in 1776. Independence Day is generally referred as 4th July or July 4th. It is a federal holiday in US on commemorating the adoption of its declaration of independence on 4th July 1776. On this day people of America Celebrates its Independence Day, There will be parades happening, barbecues, picnics and fireworks happening throughout the Country. Government and People of USA celebrate its Independence Day on 4th July every year. It’s the most significant National Holiday in America. How people Celebrates its Independence? Fireworks, speeches by leaders, parties, family reunions, concerts, fairs and general celebrations have noticed the day since the USA got independence. Parties and fireworks are the most common and well known activities associated with Independence Day. As it’s a national holiday, it’s the occasion for reunions and vacations. All major cities in USA display fireworks and there is also one major one by the White House. The United States of America which is now was made up of collection of Thirteen (13) Colonies States which are known as East Coast States. Since 1587 these thirteen states were run by the British. These Colonies were mainly dependent on Agriculture. British exploited them for their resources particularly for Tobacco. British Taxes and Laws were annoying people from long time and in in 1765, people began to demand “No Taxation without representation” calling their voice to be heard in the British Parliament. At the same time this tension erupted into fighting. To address these factors, a meeting of delegates from thirteen Colonies was conducted by Continental Congress. In the second meeting of these Delegates in 1775, A war has been declared against Britain for its independence. Next year in 1776, the Declaration of Independence was signed by 56 representatives of thirteen self-styled states which are previously the Thirteen Colonies. 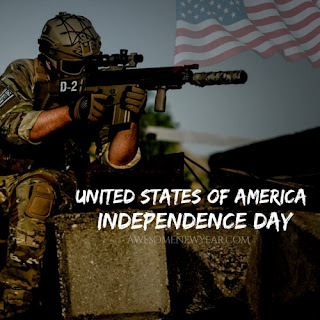 July 4th 1776, the day represents the Declaration of Independence Day and the Birth of United States of America (USA) as an independent Nation. The U.S. Congress in 1870 made Independence Day as an unpaid holiday for federal employees. One year later in 1941 Congress declared Independence Day to be a paid federal holiday.